Our practice has 3D printed computer guided dental implant placement, for the ultimate precision and accuracy, to offer a full dental implant service from planning and keyhole placement through to virtually undetectable restoration. A dental implant is a small titanium fixture (insert) that is placed in the jaw bone to replace one or more missing teeth. Implants and their artificial teeth closely resemble the look and function of real teeth. The implants form a secure base for the replacement of teeth, restoring full function and renewing self-confidence and peace of mind. They are an appealing alternative to dentures and bridges. Nearly everyone who is missing one or more teeth, and is in good health is a candidate for dental implant treatment. Dental implants can last a lifetime, unlike bridges and partial dentures that may need to be replaced several times. They can withstand biting pressures, they prevent collapsed cheeks that can follow tooth extraction, and they are more comfortable than dentures, because they are fixed in the mouth. Dental implants prevent the bone loss that occurs when teeth are missing, so the natural appearance of the smile is also preserved. With implant treatment, there is no compromise to the adjacent teeth; they are not cut down to place a bridge, or loosened by the hooks on partial dentures. Implants can only be placed in adults, because growth must be complete before placement. In most cases, the healing period is between 3 and 6 months before teeth can be attached to the implants. A temporary appliance can be made if aesthetics are absolutely critical during this period. After initial implant placement, another visit is required to ensure that healing is progressing well and to test how well the implant has integrated. After the implant crown is attached to the implant, regular dental check-ups are needed every 6 to 12 months. At these check-up appointments, the implants are examined to ensure that the supporting gum and bone remains healthy, and professionally cleaned with specialised instruments. X-rays are also taken digitally each couple of years to examine the bone structure around the implant. Dental implants also do not usually require special cleaning products and just like your natural teeth, you clean them with dental floss and brush with regular toothpaste. For the implant to function well and to remain healthy, good oral hygiene and home is required on a twice daily basis. Special hygiene appliances (brushes, and floss) are available and may be helpful if there is any difficulty with routine cleaning techniques. The implant material, which is usually pure titanium, is extremely biocompatible and the bone treats the implant just as if it was made out of bone. The bone cells attach themselves to the implant in a process called osseointegration. In most cases, implants can be placed using local anaesthesia by your dentist. Implants are not made to come out, just like teeth. Implants are not the same as natural teeth but they function and feel virtually the same as natural teeth. For patients who have had dentures or false teeth, the implant will feel much more secure. We use a technique where we are able to remove the attached implant crown if we absolutely must access the implant. Water flossers are useful for people who have braces, dental implants, those with periodontal disease, and for anyone who has difficulty with accessing areas in between the teeth. The more plaque bacteria that is removed from the teeth, the less is the chance of developing tooth decay, gingivitis and periodontal disease, because all dental disease is caused by the build up of bacteria in our mouths, sitting against the tooth surfaces for periods of time. It makes sense that anything that can increase our ability to keep the teeth clean, and motivate us to do this, is a good thing. In the fine print for use of these devices, it says that the water flosser does not replace manual flossing, so it would be best to use the water flosser along with manual flossing. However for some people who are not able to regularly floss, it can be an excellent way to cleanse the teeth and remove food debris and bacteria, with bursts of a small stream of high pressure water and air. The two that stand out for purchase are the Waterpik Cordless Plus Water Flosser, and the Philips Sonicare AirFloss Ultra. Both are rechargeable, portable, have reservoirs to fill with water, and guidance tips to blast a small stream of water and air to dislodge plaque from the teeth, and both come with warranties. It is far better to use a water flosser than no flossing at all, especially in the hard to reach areas in between the teeth where so many incidences of tooth decay and gum disease start. In the last 20 years of practicing as a dentist I am sure of one thing – having positive, nurturing regular visits to the dentist from a young age is crucial. Teeth appear at roughly six months and while brushing should begin then, a child’s fist dental visit really isn’t viable until about three years of age. Even then sometimes we can only expect a ride in the chair (spaceship or fairy cloud) and maybe a quick count of the teeth. I focus on how we can make children’s visits as enjoyable as possible. Try to prepare your child for their first visit by discussing with them what a dentist does, and what happens when you go to the dentist. Explain that the dentist might wear a special coat and mask, and will lay you back in their magic chair and give you some sunglasses to wear, while they use special tools to count your teeth. You can tell them that it won’t hurt, and it might even be fun. Even if you yourself are a bit apprehensive about the dentist: try not to pass on your own fears. Read some of the great range of books available about first dental visits. Even looking at some of the pictures will help familiarise your little ones with what to expect. Ask around your friends and family for a dentist that is experienced in treating children. Let the receptionist know when you book the appointment that it is your child’s first visit. 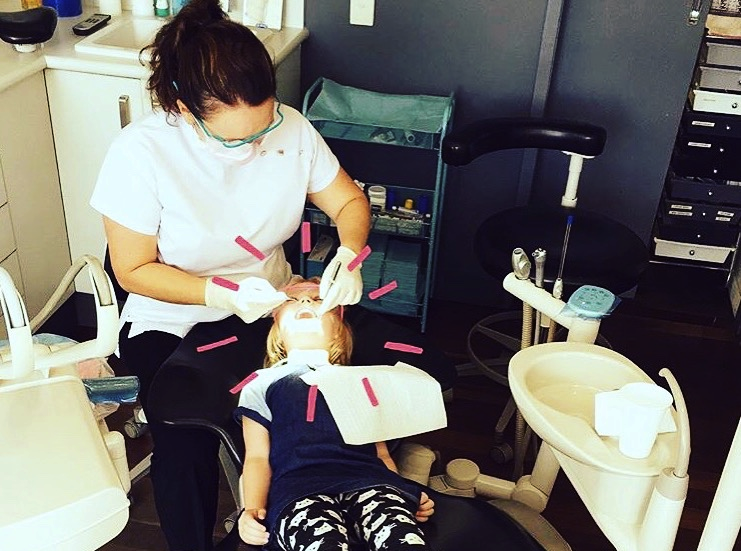 Consider booking your own appointment at the same time so that your child can see you in the dental chair and see how comfortable and happy you are!